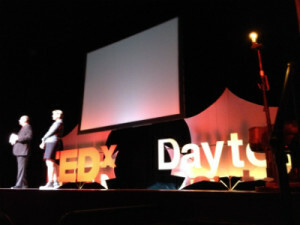 Yesterday, our community experienced an event like no other when we had our very first TEDx Dayton event. 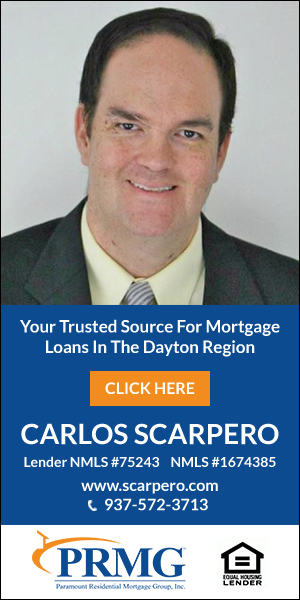 This blog post is the perspective of two attendees out of the 900 that were there, Carlos Scarpero and Danielle Deramo. Where do I begin to convey the enormity of the day and experience? One eloquent from the heart presentation after another. Sharing life journey, traumatic events, poetry, music, dance, fears, knowledge, and passions with 900 fascinated and engaged participants. No cameras, no constant tweets, all electronic devices respectfully held to breaks (few), lunch (delicious), and post event festivities around Dayton. I share my favorite take-aways from notes written fervently in the semi-darkness, front row of the glorious Victoria Theatre. Forgive me if a name credit is misspelled or unrepresented. 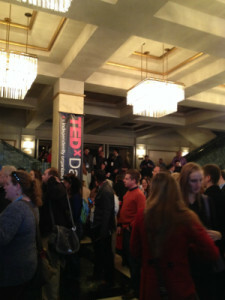 A view of the crowd in the lobby. Full house on hand! Abject Poverty. Abundance of Love. A Mother and eight children in Southeastern, Ohio. Believing her children would attend college against all odds, Imogene fostered a love of reading and learning in her children. What if we valued people based on character and how they treated one another? 3. We were created for a purpose, and that purpose is GOOD. Do whatever you do for humanity the best that it can be done.- David Shuster, M.D. What an amazing and well run event! 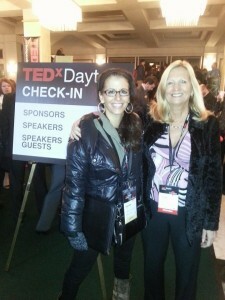 I’ve been a fan of the TED videos for a long time and have been looking forward to this event. I have the TED channel on my ROKU box and I’ll admit that I use it quite a bit. Anytime I need a word of encouragement of something positive in the world, I’ll turn on my TED channel. I purchased my ticket a little over a month ago. I’m glad I purchased it when I did, because the event sold out! What a great testament to the Dayton community. From the moment, I walked into the door, I was immediately impressed with the number of volunteers on hand. They were organized and eager to help. Right after getting my badge, I was offered coffee and doughnuts, a nice touch. 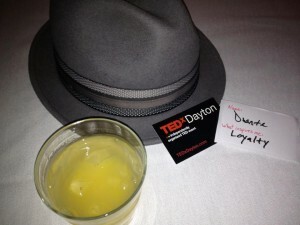 TEDx Dayton started with a live band, Good English. This was nice since there were a few stragglers coming in late. Then, there was the lineup of speakers. Danielle did a nice job with the details of who spoke with the write up above. 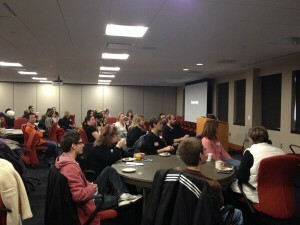 No detail was left unturned with a nice catered lunch at noon, a 3:00 cookie break and even a free t shirt at the end. The organizers were 100% first class all the way with this event! I was amazed that the entire speaker line up was made up of people that either lived in the Dayton region or had grown up here. No need to go to other towns. There’s a lot of good things happening right here in our hometown. The organizers could have taken the easy way out and filled the stage with experienced professional speakers. Instead, they went and found the “unsung heroes” that are doing things in our community that most people don’t know about. I really appreciated this. Just because they weren’t “professional speakers” doesn’t mean they weren’t quality speakers. I’ve been in Toastmasters for a while, so I’m picker than most about quality speakers. I was a bit apprehensive at first, but my fears turned out to be unfounded. Apparently, the speakers were provided coaches in advance and it paid off immensely. At least one speaker had never spoken in public at all prior to this event, which is even more amazing to me. It goes to show that in many cases, a good story and heartfelt message can easily trump experience. 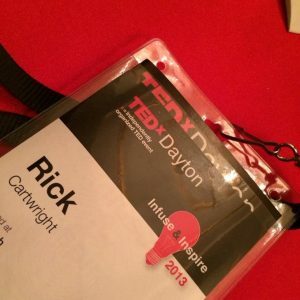 I’ve experienced this numerous times at Toastmasters, so I’m not surprised that it happened at TEDx Dayton. This event had a little of everyone in attendance. The age ranged from high schools students to retirees. Employed, self employed and unemployed were all there. It was a great coming together of our community. We DO have a lot to offer the world. We should be proud to tell the outside world about everything going on here and invite them to visit us. People of Dayton, we should be very proud of ourselves after this event. To all the volunteers, organizers, speakers and sponsors, THANK YOU!